It was early evening, one of those glorious evenings last week where the breeze off the lake was mild and the air fresh, more like late September than early November in Michigan’s Upper Peninsula. And there I was breathing it in, the last of the day’s sunshine still clinging to the air and to the trees and to the ripples dancing across Marquette’s Lower Harbor, there I was breathing it in, the freshness of this great body of water stretched out beside me as I walked on a path that I know by heart, a bike path that winds its way through the city, tracing this gem of a Lake Superior shoreline. It is here for us always, this lake and this path and the gulls who I was saying hello to on this particular day and the break-wall that protects the harbor from the thrashing storms and the brilliant red coast guard station out on a point that is no longer a coast guard station and soon will belong to the people. It is here for us always, the long sandy beaches and the rocky ledges and the place we call Picnic Rock. It is here for us always, and I have never ever taken it for granted. And yet, on this day, as the sun set over the sandstone buildings of the city, everything seemed sweeter, more precious than before. There was the way that the sky seemed more blue and those little ripple waves in the harbor more shimmery and the smell of the lake more clear and life-enhancing than I had remembered. And there was a glow in the air and a glow on the faces of the people I met along the trail. And there was my body and it was moving, one leg and then the other. It was finding a rhythm, arms swinging at my side, natural and easy, my pace picking up, my heart beating faster and happier. And then I noticed that I was crying — I had gotten my stride back. It had been a while. I think it was July that I had last walked this path, and it had been months since my walking had felt this fun. I had been back-ridden and bed-ridden, in healing mode with a health challenge, and, now, on this particular evening, I was once again among the walkers and the runners and the bikers, and it didn’t matter if my back was still stiff and my gait a little awkward and my pace not quite what it had been before. It didn’t matter what I looked like on the outside. I was doing it and it felt wonderful on the inside and “Thank you!” was my mantra as I walked along and my tears, they were an ocean of appreciation. And that’s what I want to tell you, that I could see more clearly now, not only the shimmer on the lake and the glow on people’s faces — I also could see how a part of me had been pinched off before, and it was me who had been doing the pinching. I had pruned my tree of a body and life into a neat and tidy package of health and happiness, where there was little room for a stray or broken branch, where there was little opportunity to shoot outward and skyward into a place of growth and expansion. And isn’t it a bit messy the way the trees in the wild let themselves grow? And isn’t that what we really want, to be as wild and messy and out-of-the-pruned-in-box of right and wrong and this and that as we really are? And isn’t it true that, at our deepest selves, we want to shoot our branches skyward like the trees? I know that I do. And, I know that it is from the place of contrast, of finding myself on ground that, at first, seems uncomfortably messy, that I give up the pruning and take the leap into wholehearted expansion. I believe that it doesn’t need to swallow us up, this contrast. Instead, I believe that it can be a beckoning, a reckoning to dig deeper into our core, into our alignment with Source until we uncover the gem, the desire that rises up out of this place of what what we do not want into a newfound clarity of what we do want. Bethany Hamilton is a beautiful role model who reminds me that we don’t need to stay knocked down by the ocean swells of contrast. I had heard of her before, this young girl from Kauai, who in 2004, as a teenager with a promising career as a professional surfer, was riding the waves with her best friend on the north shore of the island, when, between swells, while lying belly down on her board, arms dangling in the water, was attacked by a shark that snapped her arm right off, the whole of it, just like that. And Bethany’s life was forever changed as she found herself swimming in a sea of contrast. I knew that part of the story, remembered it from the news, how it was a miracle that she was alive, and more of a miracle that she ever climbed back on her board and rode those waves again. But the story didn’t seem intimate to me until last week when I watched the biopic about Bethany, Soul Surfer. And that brings me back to my walk along the path last week. I’m not Bethany and a shark didn’t snap my arm off below the shoulder and though I would love to, I have never surfed the ocean’s waves. But I do know what it is like to love this body I live in, to trust its strength and its stamina, and to love moving within its breath and its bones on water and land in adventure after adventure. And I do know what it felt like to find myself in a place of contrast in which this body wasn’t working like it used to work. And I do know how to rise up from the contrast and do know desire, and, sure, I do want to get this body back in adventure-worthy shape. And, I say, isn’t this walk, this walk where my stride is smooth again and my arms are swinging again, isn’t this walk on my own home turf an adventure enough? And isn’t there something more that I’m learning as I walk this path, as I move myself forward on this journey of expansion? We are all vulnerable. We all have our metaphoric shark bites. And we all are strong too, and we all can take the leap out of the contrast into a greater place than we ever have been before. And we all are in this together, on a bike path, or maybe in the ocean waves on a surf board, or maybe in a board meeting or classroom or a concert hall, in the country or the city, in this land or a foreign land, in a mosque or a cathedral or a temple, we are all in this together, in a great playground of equanimity and love. My three-year-old grandson Viren grabbed the phone from his father and yelled through the airwaves in a flurry of fast-moving words. 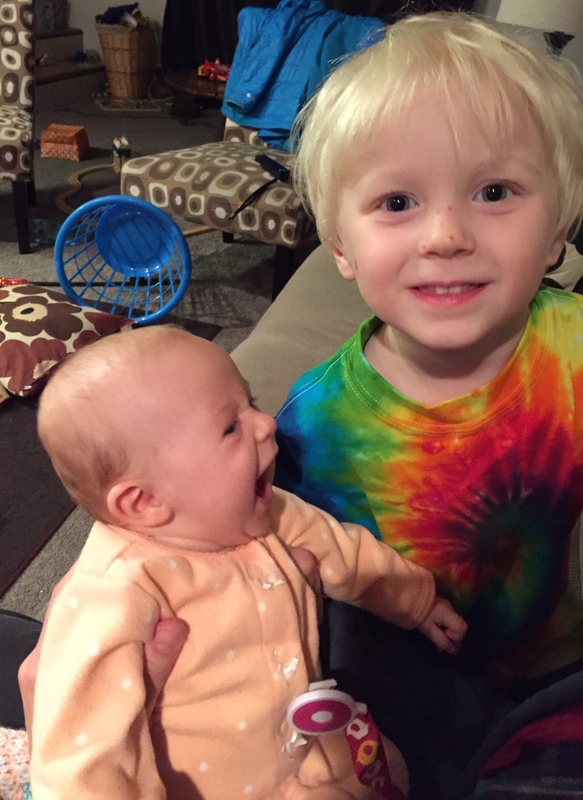 He could hardly talk — he was so excited. 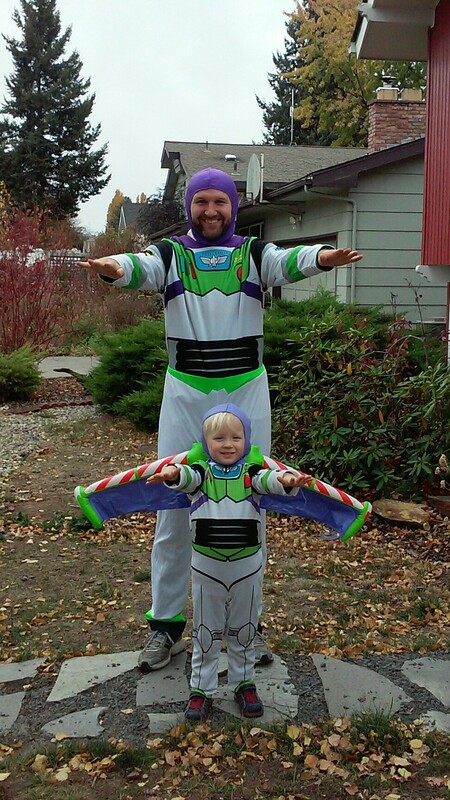 There was something about Buzz and Woody and the movie, Toy Story, and then there was the even louder jet-stream holler into my ear, “We’re doing costumes! Good-bye!” Actually, I already knew they were doing costumes. His parents had kept me informed. 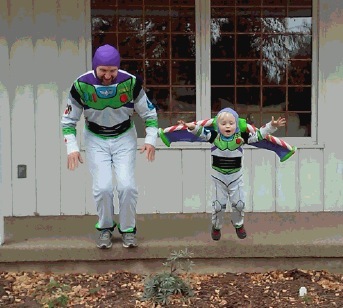 It was more than a week until Halloween, and this excitement had begun four days earlier when the Buzz Lightyear costume arrived at their house. 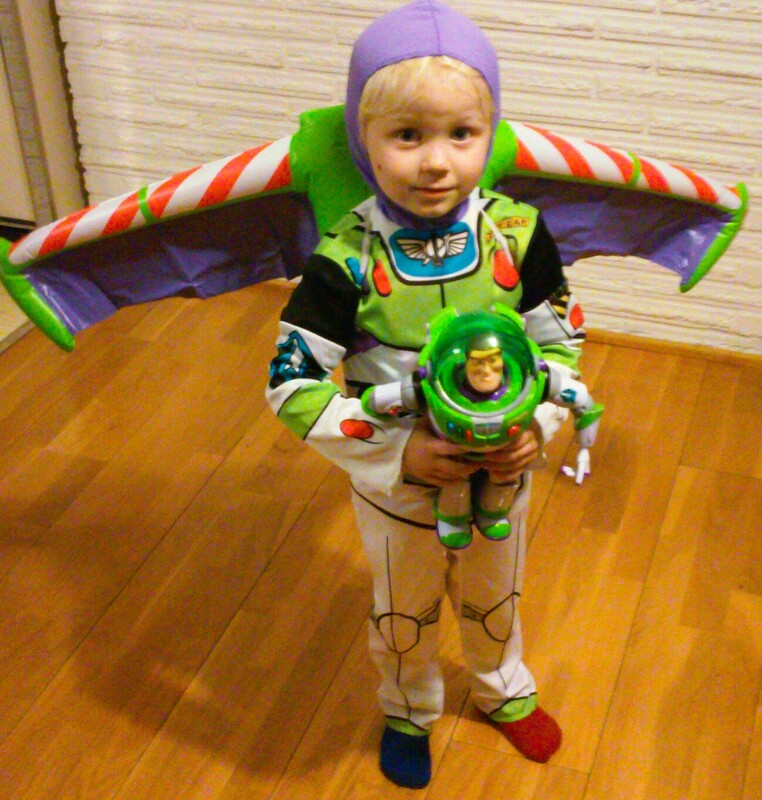 According to his parents, the minute that Viren slipped into that spacesuit and the wide-winged jet-pack, it was a done deal — the costume was not coming off. Not for anything. Viren had become Buzz Lightyear. No, that’s not quite right. He hadn’t become Buzz — he was still sweet adorable Viren, with his buoyant Viren essence. But there was something new, too, something more that he had embraced. Viren was not Buzz, but he had become buzzed with a heightened sense of his own power. Sure, Viren felt this heightened connection to a source of power when he fastened on his jet-pack and embraced the qualities of a superhero that he had watched again and again in the movie, Toy Story. And my kids did the same thing. It was Spiderman who excited Viren’s father, and the superheroes depicted on the fronts of the undershirts for preschoolers in the eighties who he embraced. But then it became something more for him, and for his little brother and for the next door neighbor girl and the friend who lived across the alley, something personal as they dug deep into the toy box for helmets and capes, as they dug deep into their own psyches, too, as they charged down the hill in the back yard, as they named themselves, “The Power Team.” They were a powerful bunch, whooping their way through their days. And so is Viren. And that power, that superhero charge, that connection to something as big as infinity and beyond, it is not the sole possession of comic book and movie superheroes. It is here for all of us. And I wonder whether it is easier for the three-year-olds to remember this connection. When I was Viren’s age, on weekday afternoons, I often would sit on the staircase leading up to our home’s second floor, waiting for my baby brother to wake up from his nap. It was my job — perhaps my self-proclaimed job — to scamper into our shared bedroom and entertain him until my mother lifted him from his crib. I carried a green and pink quilted blanket, wrapped it around me like a queen’s superpower stole, swung it like a magician’s cape, felt happy and grand as my brother broke out in uncontrollable fits of baby laughter. That was the part of my job that dealt with the world of matter, of blankets and bodies and a giggling ten-month-old. There was another part of those afternoons on the staircase, however — the waiting-for-baby-brother part, the day-dreaming part. And I have a distinct memory of one of those waiting-on-the-stairs days. As I sat on my perch, maybe looking out a window in the hallway or the adjacent living room, maybe just imagining the nighttime sky, I was thinking about the stars and how they are beyond comprehension, thinking about where I had been before I was born, where I would go after I die. I was thinking about infinity and beyond, and I have no idea how I even knew the word infinity, and, yet, I know that I was using it, that is was in my vocabulary and that I “got” it, perhaps in a deeper way than I do now more than half a century later.